Pass Hunting. To me, the term is sporting, and also evokes a romanticized notion of exploration by bike. The idea is that it’s a non-competitive, self-supported cycling sport, much in the spirit of randonneuring, but it differs from randonneuring in that it’s not about speed or progressive long-distance endurance. It’s about working, on your own schedule and at your own speed, toward climbing a specified number of mountain passes while adhering to a set of rules. Achieving the goal may be unceremonious, much like completing a brevet series, but it earns you entry into a brotherhood of like-minded cyclists who identify with and share the enjoyment of cycling over steep mountain peaks. And depending on the club, you may also be bestowed a badge of honor with which to proudly display your achievement (usually a patch or pin to attach to your handlebar bag or saddle bag). Or, forget the brotherhood and maybe you just like the satisfaction of collecting mountain passes just as you would stamps, like a hobby. One can choose to take on the sport in quiet solitude, or take a more social team-based approach by riding together in organized missions. For me, both aspects are appealing in their own ways. Pass hunting originated in France, where it’s still popular. It’s big in Japan. Few locations in the US have mountains as steep as in France and Japan, which may explain the sport’s greater popularity in those countries. But there are some pass hunting-style clubs here in the US, and there’s no reason one couldn’t work right here, in the Catskills. 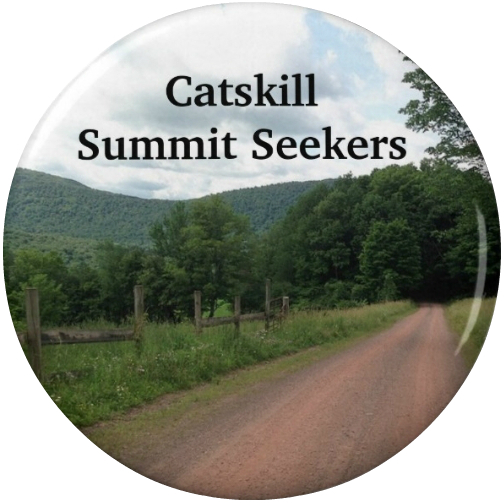 Our peaks aren’t as tall, but readers of this blog know that the Catskills have some of the most challenging hill climbing in the eastern US, and pass hunting is really about enjoying the experience of climbing mountains. One caveat to pass hunting in the Catskills is that there are actually very few USGS-defined passes (only two in Delaware County, and I’ve unwittingly ridden both). In France, the game rules explicitly disallow claiming designated land features other than passes, such as summits (which, as designated by the USGS, are abundant in the Catskills). So calling it Pass Hunting may be a technical stretch of the rules. If one wanted to adhere to rules. Another caveat is elevation: in France the rules hold that some passes must be above a certain height which is unachievable in the Catskills. Perhaps we should call it Summit Seeking. If we want to align the sport with geologically correct terms. I played around with the USGS website and found it very easy to generate table lists of geological features (along with their latitudinal and longitudinal coordinates) within a defined region, filterable by any number of criteria, such as elevation. For fun, I ran a query to identify the top 100 highest summits in Delaware County (given the dearth of passes). I limited the search to Delaware County because that’s where I’m most likely to ride whenever I’m out that way from Boston. The table is easily copied and pasted into Excel, from where the data can be formatted for import into Google maps. This means you can nearly instantly create your own Carte des cols de Google. Google does a great job with the way it allows users to annotate, sort and style the imported data, so you can label and color pins by any categories present in your imported data table (for example, you can label by elevation, and color by town, or by whether you’ve ridden it or not). You can import as many data tables as you like, for different types of data, and toggle any combination of them. One table could be summits, another could be USGS-designated waterfalls, if you were so inclined to do a bicycle tour of area waterfalls. Clicking on a map pin gets you a popup with all the information for that pin from the data table (for example, the historical name of the feature, like “Devil’s Backbone”). This entry was posted in catskills, guest posts and tagged catskills cycling google maps, pass hunting summits peaks, usgs on January 31, 2014 by somervillebikes.